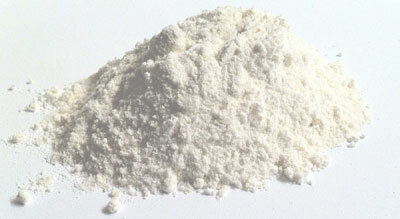 DE is a fine, flour-like substance, the microscopic remains of fossilized diatoms, a type of algae. Diatoms are found in fresh and salt water. 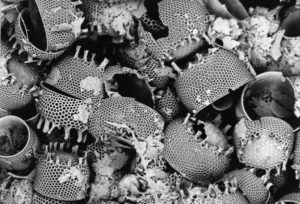 Diatom cell walls are made of silica, a component of glass. DE has been used for years as a natural insecticide to control fleas, mites, ticks, and most types of flying or crawling pests. Flea and other insects have exoskeletons and are susceptible to the glass-sharp edges of the microscopic diatoms. The shards cut through the exoskeleton surface and result in the death of insects and their larvae. DE is also a mechanical killer versus a chemical killer (like monthly spot-on flea control) so resistance to DE is not an issue. Cons: DE is very fine and silky. So it can be messy. Apply outdoors or in a garage if possible. Do not breathe it directly. It may make you cough or sneeze! (cover dog’s eyes nose and mouth while applying—a damp towel works great) If dogs ingest it, it is absolutely safe. DE must be dry to work. The worst they could do is let out a loud sneeze. DE is safe and effective as an add-on to an existing flea/tick control plan or can be a standalone insect fighter.